Crispy Tadyang ng Baka is a popular pulutan usually served at Filipino specialty restaurants. It is made up of beef spareribs pre-boiled with adobo ingredients until tender, then deep fried and serve with vinegar chili dip. I have been planning to cook crispy tadyang for sometime now, I could not find beef spareribs on major supermarkets here in Australia. Probably because the beef ribs are usually cut as steak. Today I happened to change by a beef spareribs in already cut crosswise about 1 1/2” with generous amount of meat at a meatshop. I immediately purchased a kilo for that long overdue post of Crispy Tadyang ng Baka. Here is the recipe. 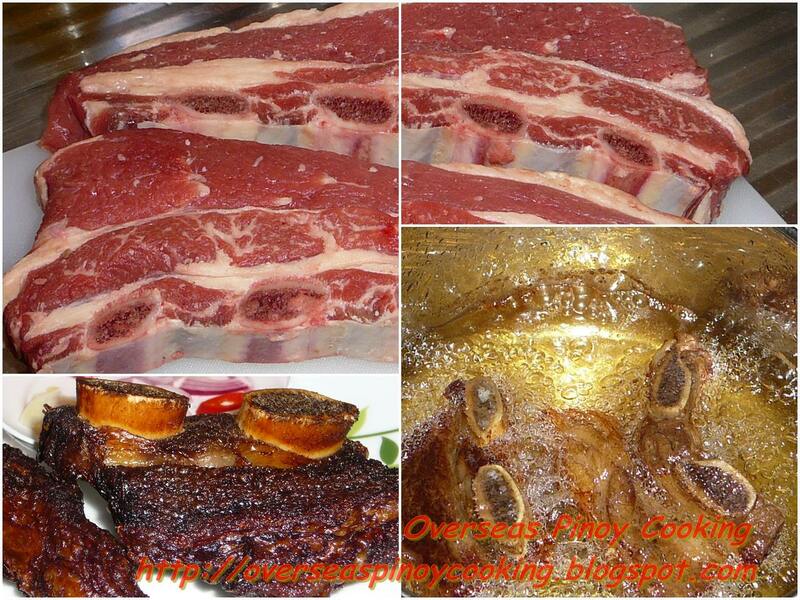 Cut the beef spareribs in sections to accommodate in a large pot. Add all the ingredients except the cooking oil in the pot, add 2 to 3 cups of water or until beef is covered with water up to an inch above. Bring to a boil and simmer for 1 to 1 1/2 hours or until very tender but bones intact. Add more water as necessary and remove scum that rises, when almost tender reduce liquid until just enough left to keep from burning the beef. Remove beef from the pot and let drain in a colander, keep chilled until ready to fry. Heat enough oil in a deep fryer, fry the beef spareribs in batches for 1 to 2 minutes each side or until crisp on the outside but moist in the inside, remove from the fryer when done and drain excess oil in kitchen papers. Serve with vinegar with garlic, onion and chili dip.